Did you know? That changes to the Apprenticeship Levy means that anyone regardless of age or previous experience can now become Apprentices? The only restriction with the new Apprenticeship Levy is that your learners must be training in England. To find out more about the Apprenticeship Levy, please click here. With Smart Training and Recruitment, not only can you hire apprentices, but you can also train and develop your existing team. By investing in your staff, you can help them progress their career and create new opportunities for your organisation. Investing in your staff can be financially rewarding, as they are more efficient than new hires and will increase productivity. Investing in your workforce has also been proven to motivate your staff more effectively than a reward scheme. By upskilling your staff, you are saving the time and monetary costs of sourcing new suitable staff to fit into your business. Apprenticeships are no longer just for 16 to 24-year-olds, anyone regardless of age or previous qualifications can now become an apprentice. 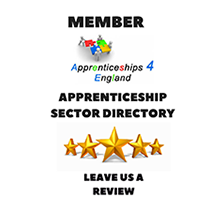 Apprenticeship standards can be tailored entirely to your business. We can help you plug the skills gap within your organisation and work together to build a training programme that will benefit your workforce and their capabilities. The success of 85% recent Ofsted Inspection feedback confirms our outstanding employer engagement and the fact that we have successfully achieved over 16,000 Apprenticeship programmes that are challenging and stretching to achieve, speak for themselves. We pride ourselves on working in partnership with employers to make a real difference to their business. This is done through on-going engagement with managers in your organisation to plan meaningful learning for your staff that focus on your key business objectives and priorities. All training and assessment for these programmes are delivered in your workplace, removing the requirement for your employees to attend any form of day-release for classroom learning. The only exception to this is with regard to completion of national exams, where we may require your staff to attend an alternative location if suitable provision cannot be provided on your premises. We will also continue learning remotely with the use of our eLearning portfolio OneFile, and as the employer, you will receive a unique log in to monitor the progression of your staff. If you think upskilling your staff could be a viable option for your business, please contact a member of our team on our live chat or complete our contact form. Our business has been built on apprenticeships. Rising through the ranks is a consistent theme of individuals growth at Rapanui, it gives them a sense of purpose, incentivises them to exceed in their positions and gives us staff that are capable of managing departments even more effectively – knowing their colleague’s jobs inside out as they do, as they once did it themselves.